After two Good Wood Awards, it looked like The Forum Seeker was here to stay. Or so we thought! The Seeker is gone. 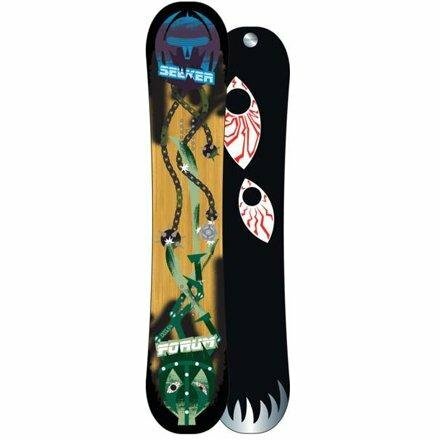 This board will suit anyone who likes to ride fast switch, enjoys riding regular on the mountain, and wants to hit big kickers and the super pipe. Just like everyone says, you can go huge with this, but it’s not bad going at medium speed. With so many noodle park twins it’s great to find a stiff, fast twin with good edge hold. It’s a good competitor to the Salomon Official. Both are similar in shape and riding style. 2010 & 2009 Good Wood Top 5 in the Pipe Award Winner. Conditions: hard to soft to about 1.5 feet of powder. With our first look, we were more impressed with the graphics on the board in person than in the pics, but they leave a little to be desired. The Seeker is very light and seems very well built. We didn’t get 100 days on it but it looks like it can handle a season or two with a semi-aggressive rider. 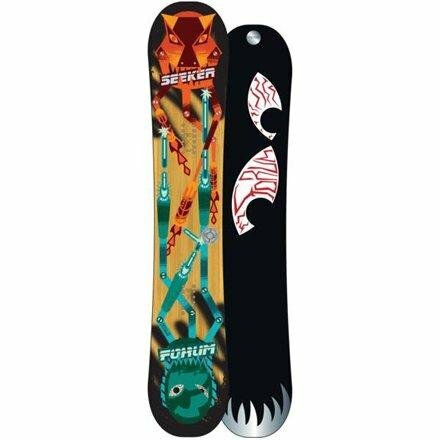 The Forum Seeker has a good amount of camber and is pretty springy, and it’s pleasant to see a cambered board win a Good Wood Award in this day and age. This board has excellent edge hold and performs well in and out of the park. So here is how it rides. On Snow Feel: The Seeker is fast, stable and technical. You should understand camber and the consequences of camber before riding it. Powder: The Forum Seeker is a small twin so don’t expect much. If you rip, you can ride anything but it’s a lot more fun to go with a reverse camber or a board more specific to powder days. If you get out there, you will find it does pretty well compared to other cambered boards of its size and shape, but if you’re in the deep stuff, it’s not going to be easy. We had a lot of fun in 1-2 feet of pow but we just didn’t have the heart to take it out on a deeper day with so many powder snowboards to review. In 1-2 feet it didn’t perform as well as other boards getting you through the already tracked out sections. Turn Initiation– It is not as stiff as Forum makes it out to be and it has a pretty deep side cut so this can turn on a dime. It doesn’t have the ability to make the long sweeping g-force turns that bigger directional boards can make, but it is fun to make tight responsive turns. It also has a very playful edge to edge feel that we really enjoyed. We had a lot of fun carving on this board even though we were set up with a duck stance. Compare this to some of its reverse camber competitors and this blows ’em away when it comes to carving out a good turn. 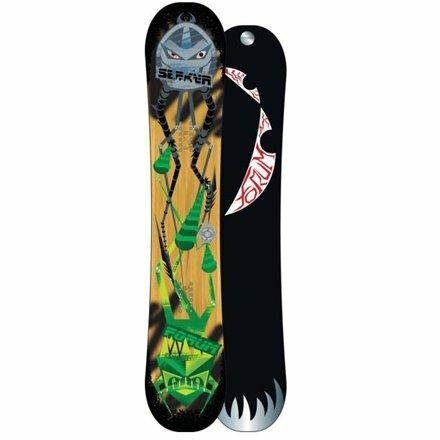 Speed: This board is pretty fast for its flex, but you would expect that for the price. The base is pretty fast and the board does pretty well in chatter. Uneven Terrain: The seeker isn’t bad here and can handle bumps pretty well. Edge Hold: Most of the days we tested this board on were either hard pack or mixed condition groomers. For a board that isn’t that stiff, we never lost an edge or washed out on an icy patch – this must be why it’s a favorite in the pipe. 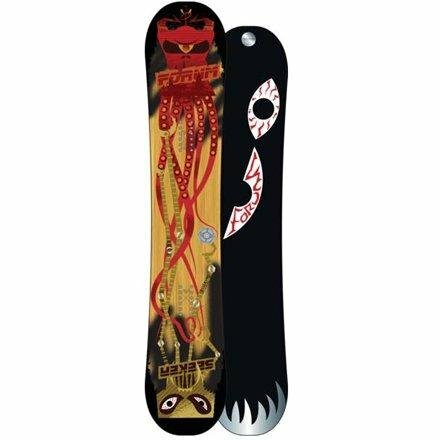 It has good grip and is really dependable on an icy pipe wall. Well done! Flex: After flexing and riding this board we were pretty surprised that Forum rated this a 7 in stiffness. We see this more as 2.75 out of 5. 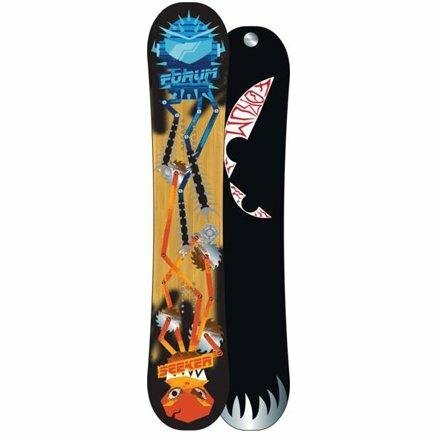 This board has a very even flex that is on the stiff side of the middle, with the nose and tail seeming to have the same stiffness as the mid section. It seems slightly stiffer torsionally so that might be why they gave it a 7. Jibbing– If it wasn’t for the incredibly sharp edges and uniform stiffness this would be a great jib board. It is just average and can still be fun if you get in the jibbing mood once in a while. The mid flex is meant to work good on rails, but the edges are very sharp and catchy. If you want to file down the Seekers precious edges then you can turn this into an adequate rails and boxes board, but then you’ll loose an excellent pipe board. So bottom line, the board was not meant to spend the majority of its life sliding across hard objects. Switch: The Seeker is a true Twin with a centered stance, so riding switch is just like riding regular. It’s a great way to get better at riding switch or to go even bigger while riding switch. Pipe: If you ride switch and like the pipe, this is better than most pipe boards for hitting or landing switch. The edge hold is exceptional and gets you up and out of any size pipe wall. We tried this in 18′ and 22′ pipes and found it to be just like The Good Wood described it. Jumps: This is the boards second best quality. As a true twin with good speed and a forgiving flex, the board can handle going as big or small as you want to go – no matter which way you take off or land. All in all, we were pretty impressed with Forum’s Seeker. They really figured out how to make a great pipe and jump board for people of all levels. This was a board we added to our quiver for a season. We try to get as many images of the Forum Seeker, but forgive us if they're not all there.